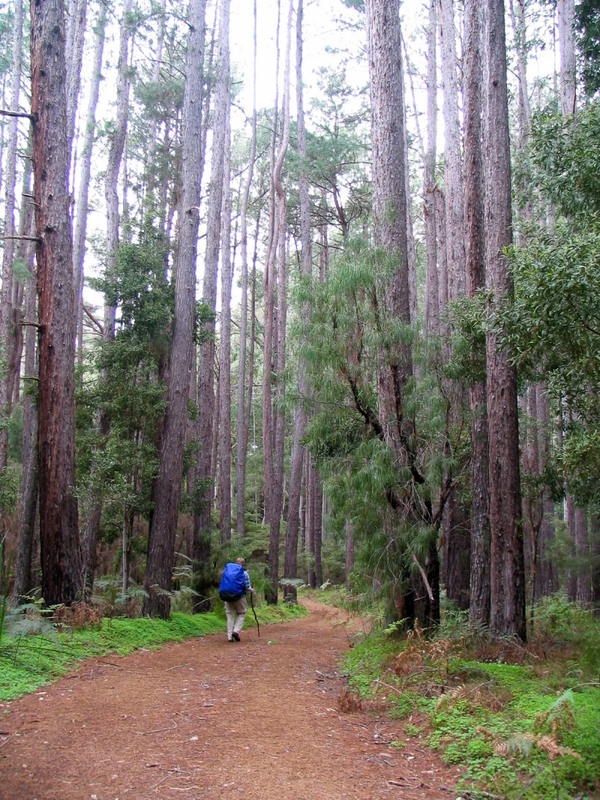 The walk from Pemberton to Northcliffe is well known for pleasant walking through the karri forest. As it’s only a three day, two night walk between towns it is the perfect section for a quick getaway. 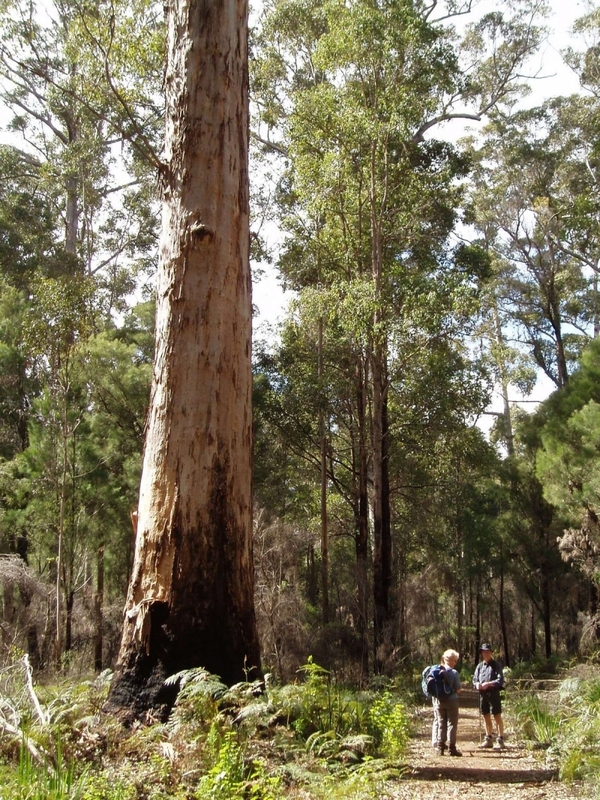 At 72 metres in height, the Gloucester Tree is the world’s tallest fire-lookout tree. Shortly after leaving the town the Track passes directly under the Gloucester Tree, in Gloucester National Park. In the past, foresters maintained a regular fire lookout from a platform sitting fifty-eight meters high in the crown of the tree. 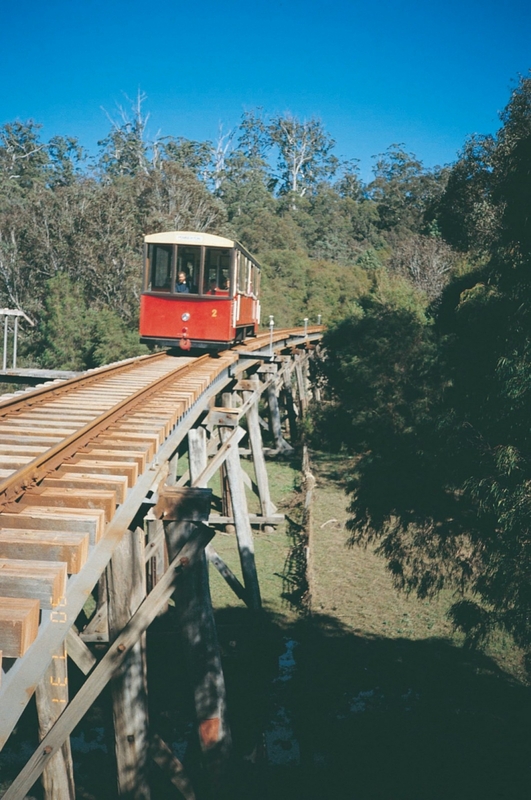 The Gloucester Tree lookout was built in 1947, and construction coincided with a visit by the then Governor General of Australia, the Duke of Gloucester. He and his entourage picnicked while they watched forester Jack Reynolds at work, cutting away branches to clear a space for the platform. The lookout, and subsequently the whole national park, was named after the Duke. The tree is no longer used as a fire lookout but is a huge tourist attraction. Continuing south the going gets a little tough as the Track climbs in and out of the rugged Warren River Valley. The Warren River was discovered by Lieutenant Preston in 1831, and the name was probably applied to it by Governor Stirling, possibly in honour of a friend of his, Captain Warren. The Track crosses the river on the River Road Bridge, a wooden trestle structure built in the late 1930s for the log hauling railway, and then leaves it at Moons Crossing, a spot used by the early settlers as a crossing point on the river for their cattle. Close to Northcliffe, in the Gardner River valley, the soils and landscape change dramatically, with the karri forest giving way in places to deep sands, gentle undulations and low scrubland. The walk south into Northcliffe offers a wide variety of vegetation and terrain, including sandy tea-tree flats and farmland. The Northcliffe Forest Park has a rich floral display in late spring, in particular the various climbing plants, which scramble and twine through the understorey in a jumble of colour. Northcliffe is located at the transition between karri forest and the open, low-lying vegetation of the coast. Nyoongar Aboriginal people managed large tracts of this coastal country as grazing habitat for thousands of years. They used a mosaic of cool fires on a two-yearly rotation to stimulate plant growth and maintain diversity. In later times coastal cattlemen continued this practise. For more information on walking from Pemberton to Northcliffe go to the Section by Section Guide.